Concerning the ongoing PDP, presidential candidate, Atiku Abubakar has to say after he voted in Jada, Adamawa State in today’s Presidential and National Assembly elections. Meanwhile The wife, Titi, accompanied the former vice president at 10.06am at Jada local government area of the state, in Adamawa State Nigeria. 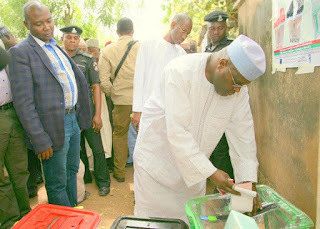 He added,On if he would accept the result if he is not the winner, Atiku said he is a "Democrat" although epressed optimism that he will emerge winner and await successful transition this time. He added that he is so much impressed with the turnout and he hope presiding officers will be able to cope with the turnout. Now let's hear what you have to say concerning his speech, If he is wrong or right to what he said.